I’ve been meaning to do a post on Doha airport for some time. It keeps not happening, though, as I’m usually just too exhausted to write when I’m there and, once I leave, I’m either back to everyday distractions or I quickly move on mentally to the reason I was traveling in the first place. But this morning at 2 am, I’m running out of things to keep me awake, so maybe I’ll give capturing this place a shot. Its something like my 20th time through this airport in the last five years. Its become a hub that joined the dots between our life in Manila to DC, Athens, and London, and continues to be our lifeline out of Nepal. All this will change when we move to Jamaica, of course. But for now, its the center of our traveling universe, and today it’s key in returning from Cape Town, South Africa back to Kathmandu in only two flights. Pretty amazing really. However, the layovers are nearly always long….. 6, 8, sometimes 12 hours or more. Flights truly leave 24 hours a day, there’s no downtime time at Hamad International. In fact, the wee hours seems to attract more people as Qatar Airlines works at making its airport the center of the world’s flight path between both sides of the globe. Here at 2am, the airport if filled from people everywhere, served by a staff from everywhere. Apart from a few Gulf Arabs in traditional white dress with their black-clad wives trailing behind, there’s very little to remind you where you are. International brands are everywhere – clothes, restaurants, watches and electronics. But there’s nothing quintessentially Qatari, except perhaps dates and pistachio nuts. Qatari staff are few and far between, especially women, and the planes and service desks have employees from all over the world, including Filipinos and Nepalis. It feels like a hotchpotch of everywhere we’ve lived all rolled into one. If I had to pinpoint one thing that keeps it feel so strange for me, it is seeing people from twenty different countries all speaking the universal language of English — not just to me — but to one another. If English was suddenly removed as the common denominator, all communications would break down instantly. It just feels bizarre, especially when I haven’t had enough sleep! 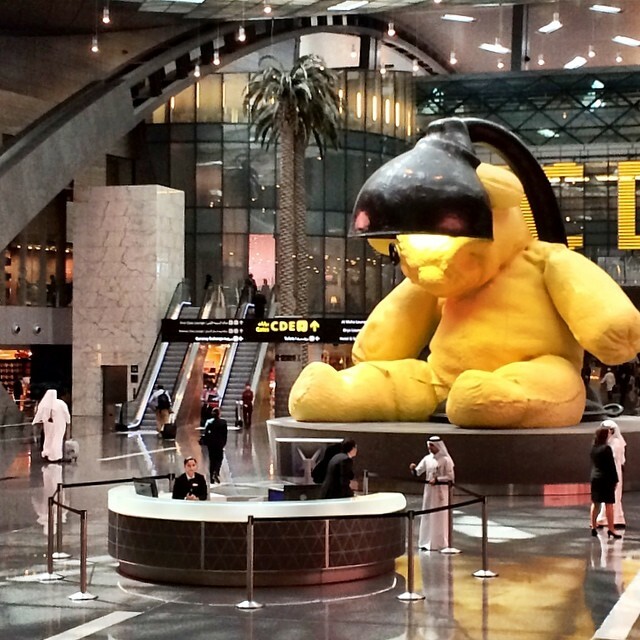 Doha’s $21 billion Hamad International Airport opened in the last year, and the new facility is unbelievably large with a giant business class lounge and duty-free section. The sprawling 29,000 sq km airport was built on reclaimed land and is approximately 1/3 of the size of Doha itself. Its so radically different from Kathmandu. After a mere 4.5 hr flight, arriving here feels like being on another planet. As I adjust to the size and scale (and cleanliness) of being in a modern airport once again, one of the first things to grab my attention is a giant teddy bear which sits as a main focal point outside the duty free. I have to say, the thing is horrendous. Actually, this photo doesn’t do the bear justice….its far worse in real life! Apparently it is an Urs Fischer sculpture, which belongs to a member of the Qatari royal family who purchased it in New York at a cost of 6.8 million dollars. I’ve never seen a teddy bear less appealing. Perhaps its supposed to be an endearing representation of a child’s well-loved,teddy bear friend. But it just looks creepy. The seller must have been ecstatic. If I owned it and had that kind of money, I think I would personally pay someone that much just to haul it away. Show us something impressively Qatari, and not just big, as big seems to be synonymous with impressive here. It’s the wrong kind of center-piece, Qatar, in the middle of an otherwise very impressive airport.